It is food shopping day again. Would you believe that this is one of my favorite things to do? I love going to the supermarket, browsing each aisle as I go through my shopping list. I guess when you become a mom; you will learn to love it. The only change is that I do my food shopping late at night when the supermarket is not busy. I do not like to go during weekends because of the crowd. Thanks for supermarkets that open until 12 midnight or 24/7. Top of my list is pizza. Do you still remember the Shakey’s pizza? We are so fond of their pizza especially the thin and crispy ones. Every time we place an order for pizza here, we always make sure that we get the thin crust pizza. But let me tell you something. 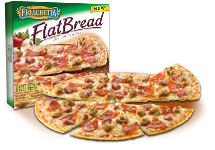 Freschetta FlatBread has a thin crust pizza called the freschetta flatbread pizza. It is made of ultra thin crust, created to bake up incredibly crisp. Thin crust is the best. Do you want to try it? Here’s what you can do. Go online at freschetta.com and get a coupon for $1 off your pizza so that you can try what this amazing flatbread pizza from freschetta. They are available at your favorite supermarkets in four flavors – zesty Italian, roasted garlic & spinach, pepperoni and 5-cheese. Now you can probably tell what is for dinner tonight. My favorite is pepperoni and roasted garlic and spinach. I am not really sure what this is called but this is from Pampanga. It is a favorite pasalubong from Philippines. I got two boxes and I almost did not share it to anybody except to my daughter who does not really like nuts. I brought one box to my friends at work ( they are not Pinoys) and how they liked it. They said it is tasty but not sweet, good to be eaten with coffee. I wish I have ordered more. When it comes to baby needs, there is no other store that comes into my mind than Babies R Us. Do you know that we got our daughter’s name from one product carried by Babies r Us? It was while we were doing our registry that my husband saw the name Isabella. Here is good news from Toys R Us that all budget conscious mothers like me would love. Toys R Us has officially announced that they will be selling Babies R Us brand of infant care line of products at its store. This Babies R Us brand would include infant formulas, diapers, baby wipes, laundry detergent and purified water at prices at least 50 percent lower than other brands. Actually, I already saw some Babies R Us infant care products at their stores since last year. If Babies R us brand of formula is a lot cheaper than comparable brands, I am sure a lot of mothers would love the big savings they could get. I still remember how many cans of baby formula I buy every month for my daughter and they are not cheap. These are all must haves for our babies that we cannot do without. We just have to be thankful to Toys R us and Babies R Us for offering cheaper baby products of the same quality as comparable brands. For value conscious shoppers, getting big savings on baby products without sacrificing quality is a big help in your budget. Go shop at Babies R Us now! It is during summer time that we enjoy a lot of fruits. They are in season and a lot cheaper than any other time of the year. I'm referring here not in the Philippines. I know it is all year round there. Here are my recent buys. I bought a box of cherries from Costso for $8.99. They are not the sweetest but good. Hubby and I started eating them while we were still inside the car on our way home. The mangoes are from the Oriental store. That is what they called "champagne mango." It's $12.99 for one box (15 pieces). So sweet!!! 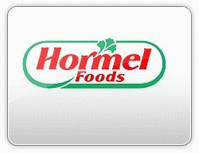 This is a Sponsored Post written by me on behalf of Hormel Foods. All opinions are 100% mine. My husband is in the P hilippines for a couple of weeks so it was only me and my daughter at home. While hubby was away, I was not making some cooking in the kitchen. All I made were easy and quick meals that would not take so much of my time. But by tomorrow, it is going to be different story since hubby is already home. Actually yesterday I already did my food shopping for the week because I know starting tomorrow night I will be cooking for our dinner. I also bought a lot of hormel products like the Dinty Moore Hearty Meals and Hormel Chili Master. We go fast on the Hearty meals. My daughter loves the chicken noodles and the chicken & dumplings and I bring to work the microwavable products for my lunch. I also have to stock up on Hormel Chili now that is summertime. We had a pool party at my friend’s house yesterday so I bought two big bags of tortillas. I spread the tortillas in two large trays, pour several cans of Hormel chili, cheese, cabbage and diced tomatoes then put it in the oven until the cheese is melted. When the kids saw it, came running from the pool and they were grabbing the food like crazy. They were all hungry from swimming that the Hormel chili over tortillas was gone in few minutes. You can try this at home. So quick and easy plus the kids love it. Do you have your own recipe? Why not share it at http://www.hormelrecipes.com? For 75 years now, back from 30's as our parents watched Jiggs and Maggie doing the Dinty Moore advertisements and now with new Hormel Chili varieties such as white chicken chili and roasted tomato, we have loved Hormel products and forever be loving them.